You can now reserve a table for the show and pre purchase food and drinks. We'll be sending round an email in advance of the show to take your orders. This will include bottles of wine and buckets of beer. We'll also keep the bar open for an hour or so after the show. Doors and bar open at 7pm with show at 8pm. After losing a bet in 1998, Anthony Crawford has become a fan favorite across the country. 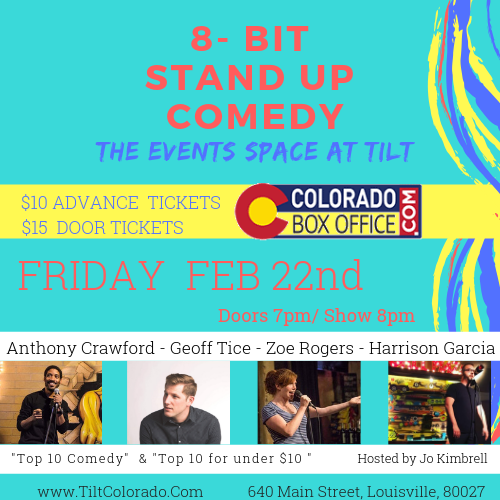 His stupid thoughts & energetic stories have caused several news publications dub him "Funniest Man You've Never Heard Of"
Geoff Tice is a comedian from Denver, Colorado. He is a regular at the world-famous Comedy Works and performs in clubs, bars, and basements all across America. He has also performed at SF Sketchfest, Red Clay Comedy Festival, and High Plains Comedy Festival. Zoe Rogers gets her material and sleep deprivation from her three awesome kids who make sure that life is never dull or quiet. Zoe has been featured on Disney Babble and Nickmom.com. She has performed around North America and the UK including the She Devil Comedy Festival, in New York, Laughing Skull in Atlanta, and Edinburgh Fringe. Harrison Garcia is a comedian and musician based in Denver, CO. He hosts a monthly standup showcase at Jagged Mountain Brewery in Denver and showcase at Dry Dock Brewing in Aurora, because craft beer and laughter are a perfect pair.